So, what does "informal formality" mean, and how does it relate to setting the table for a dinner party? While I can't claim to be an expert on the topic, I can certainly share my personal approach. For me, it's a concept that allows us to use our "Sunday best" china and silver in an unpretentious way, one that both makes our guests feel special and puts them at absolute ease. 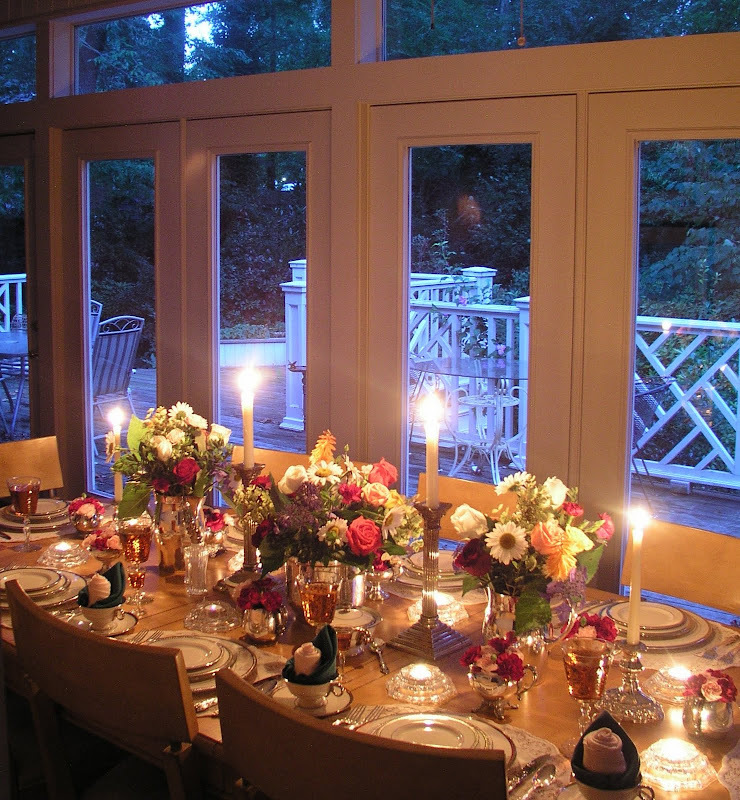 Setting a beautiful table lets friends know we value them highly and consider their presence a cause for celebration! The trick is to make it seem effortless, without appearing ostentatious or overly staged. 1. It's not set in the formal dining room. In fact, it's in the sunroom, a space intended for casual relaxation. 2. The table and chairs have a definite mid-century modern feel. 3. Placemats are in use, rather than a carefully-starched and pressed tablecloth. 4. To save time and effort during the dessert course, cups and saucers are already on the table for after-dinner coffee. 5. The centerpiece consists of assorted, mis-matched silver serving pieces (from thrift shops and estate/tag sales) holding a mixture of supermarket and garden flowers, casually arranged in a "crazy quilt" of disparate colors and varying shapes. Next, I thought you might like to see how the centerpiece began. The vase on the left contains assorted supermarket roses and two bunches of miniature carnations. They'd been reduced to less than $8 for all you see here. I cut the stems at an angle (under water) and quickly immersed them in the vase filled with lukewarm water and "flower fresh." They've been left to condition overnight. The aluminum ice bucket on the right holds garden flowers, including some blue lacecap hydrangeas a neighbor was kind enough to provide (she knows I have a blog and offered her hydrangeas and magnolia blossoms). The shasta daisies and "red hot poker" blooms are from the cutting garden. The azalea cuttings are also from the garden. Unless your goal is shabby chicness, there's really no way to avoid polishing the silver. I work rapidly and avoid removing the darkened areas that enhance details of the vintage silver patterns. 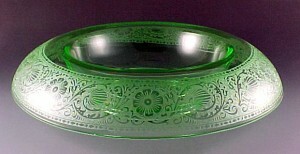 It's part of the patina that gives pieces that desirable look of "old family silver." Using these assorted creamers and sugar bowls as small vases gives me a chance to use, re-purpose, and display favorite pieces I've collected over time. Many of them cost as little as 99 cents at places like Goodwill. Some are sterling (those unfortunately did NOT cost 99 cents). Since the azaleas stopped blooming weeks ago, they're here primarily to provide structure to help hold other stems in place. Hydrangeas also work well for this purpose. This approach makes it possible to avoid having to use oasis (wet floral foam) to hold flowers where you want them. Some florists say cut flowers last longer in water minus the foam. It's certainly easier to tell when additional water (or changing the water completely) is needed. I'm using a silverplated ice bucket to hold the center arrangement and plated water pitchers for the two smaller ones. I realize the arrangements appear tall (particularly when photographed from certain angles). I sat down, looked across to check their height, and determined that eyes could still meet across the table. In the real world, it's better to keep the centerpiece low. An easy remedy would be to use shallow containers (which probably WOULD require floral foam to hold the stems upright). Some people like to have the table set for maximum impact as guests arrive and then move flowers to a sideboard (or into the living area) when it's time to sit down to dinner. The miniature arrangements and candles would still provide beauty and ambience, and the center of the table would be available for serving the meal "family style." Perhaps I've done enough talking for today. Wouldn't you rather just look at the photographs? I'll list the "ingredients" at the end. The rosebud napkin fold is demonstrated in a video on the Southern Lady Magazine website. You can view it HERE. Perhaps you're wondering why I have such tiny glasses on the table. I have a Croatian friend who always serves strong, sweet liqueurs with dessert and after-dinner coffee. Guests can sip directly from the glasses or pour the contents into their cups. My friend also offers her guests whipped cream with their coffee. It's one of those little extra touches that can elevate a meal into an event. As noted above, the silver serving pieces are all estate/thrift finds. *The vintage water glasses, glass luncheon plates, and cordial glasses were a definite "steal of a deal" at a local estate sale. I had admired them the first day, but decided to wait. They were still there when I stopped by during the last hour of the final day. They'd been reduced by half. I asked if they could do a little better and ended up paying 70% off the asking price! Did I need them? No. Do I like them? YES! And don't we all love a bargain? 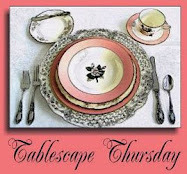 Please join our high priestess of tablescaping, Susan of Between Naps on the Porch for Tablescape Thursdays. You'll be very glad you did! I miss the days when people put a little extra into entertaining. I know it is time consuming, but it is so memoerable and delightful. I try to do it on from time to time and it throws guests off guard and yet makes them feel so special. Bill, this may just be my all-time favorite tablescape that you have ever done. I realize it isn't nearly as formal as most, but it just speaks to my heart, as I'm such a collector of silver (plate mostly, although I also adore sterling). I am one of those crazies who HAVE to polish mine, no tarnished silver for me. Your arrangements are beautiful, a true haberdashery of colors that is so appealing. The napkin "rosebuds" are also pretty. 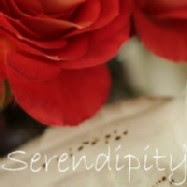 I love the closeup pic of the sugar bowl filled with florals ~ reminds me of a tiny loving cup with the double handles. Thanks for sharing the beauty! Sigh! Your table settings are always gorgeous, but you've excelled yourself this time. Gorgeous in every detail, Bill. I think my favorite touch is all the small silver containers with flowers. It's fun to repurpose pieces like that and adds interest. Lots of flowers really make a statement, and your napkins rolled as a rose in the cups is a sweet touch. Bravo! So very pretty - great way to display the beautiful roses. Beautiful table...the flowers are gorgeous! Lovely table, the flowers look wonderful!!! The sunroom seems a great setting for an informal meal.I think the table would look great with just the sunlight casting shadows with the smaller flower arrangements.Love the napkin in the cup I will have to look at the video. Happy 4th of July Bill! I'm off to a very important wedding! I will be taking pictures! This entire table is lovely. Wish I could sit down for dinner and a drink. B E A U T I F U L!! I loved all the photos, it almost feels like I'm actually there. I can totally see how your guests would be really comfortable in this setting. So, somehow you knew I was going to try to get back to some blog reading today and you talked about the flowers, which you might remember is my favorite part of tablescaping! I am going to steal that idea of the individual silver pieces with the flowers...l love the look! I do polish my silver. I don't really mind doing it, it doesn't take much time and I think it is somewhat relaxing. The pieces I have out need it now...maybe a weekend project. Things have been pretty stressful at our house lately so I haven't been around much. I hope to get back into the swing of things soon. Hope all is well on your end. Just lovely, I especially like the silver used for flower arrangements! Gorgeous china, gorgeous silver, gorgeous crystal and gorgeous flowers! Love it all. Lovely and inviting. I gravitate toward tiny glasses so I love the idea of serving liqueurs for coffee in them. Such a beautifully elegant and timeless table. I love it! Everything is sparkly and shiny, the flowers are gorgeous and the table just calls out to you. Your tables are always so beautiful! I just love looking at all the details. I also serve whipping cream in my guests coffee with chocolate sprinkles! It looks fabulous and my guests love it! Thank you for sharing your beautiful table. Bill...this is exactly as titled!! It's elegant and joyously colorful! I just love individual floral arrangements and your silver makes them all so special. I also love having the after dinner coffee things on the table too. Bill, I love the welcoming "pull" of the flowers in this tablescape -- especially the pinks in the little sugar bowls. Those pics are my favorites! What a beautiful table. Your photography is gorgeous. You have quite an artistic eye. Bill-I love the way you've used the cream and sugars throughout your table setting. It's a great idea! As usual, you've done a wonderful job. thanks for sharing! Bill, your table is so rich and regal looking. I love the way you've used your silver through out the table..The backdrop of your deck is such a draw . I can imagine heading out there after dining at your beautiful table with a glass of wine and lots of conversation. Bill, It's stunning! I love all the little details that you pay attention to. It really does make a difference! My favorite part of this table is how it glows by candlelight, and in turn accents your floral centerpieces. You are a very talented floral designer, Bill (AND tablescaper as well)! Come see me when you have time; my garden is near peak and quite glorious. We recently hosted a tour of 511 people! It's lovely Bill, I always enjoy the bounty of your cutting garden too. Since I am a mere baby, I love the way you break everything down. The rosebud napkins....fabulous. I hide all my silver, yuck! I have a 15 year old who pouts at even the mention of using it, but I think I may have to pull out a few pieces (and a box of tissue for her) and give it a go! I adore how you make it all look so grand with thriftiness and aren't afraid to admit to it KUDOS!!! Hey, Bill. I am just getting back to the computer a bit after a long absence. What a beautiful table to come back to! The florals are all super, and the use of the creamers and sugar bowls...genius! I love the formal informality of it all. Amazing table! Take care. I will talk to you soon. Comfortable & Understated, yet classically beautiful.